Has your child ever received any learning or behavioural support? For Kindergarten Stage children. Is your child toilet trained? I confirm that all the information given on this form is accurate. The loss or damage of valuable items. Accidents or mishaps occasioned by participating in normal life activities including, but not limited to, organised sports, school trips, gymnastics, informal play, design and technology and practical work. 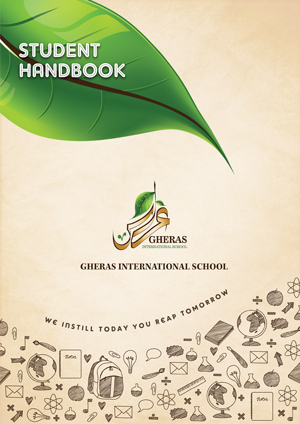 The welfare and safety of the student outside the normal timetabled day including activities supervised by Gheras International School staff. 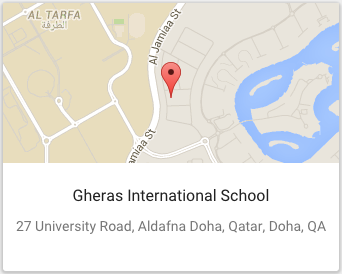 This includes safe delivery and collection of students to and/or from Gheras International School. Please note: it is the responsibility of parents or appointed adults to ensure that Students are dropped off and collected from school at the appropriate time. Any resulting accident or mishap should a student take unilateral action which is extra-curricular and without permission including, but not confined to, leaving the premises without permission. I/we accordingly release and absolve the members of the Board from all personal liability in respect to the affairs of the school. I agree to abide by all the Rules and Regulations of the School and accept that the decision of the school management in any matter relating to the administration of the School is final. I agree that photographs/video or movie clips of my child may be used by GIS in promotional materials such as the school website, in-house slide presentations, brochures, local/international press, and in the Yearbook. I understand that in joining GIS, I agree that my child will take part in the whole school curriculum and cannot choose to opt out of any particular part of the curriculum during the academic year. I understand that it is my responsibility to ensure that school fees for my child are paid by the due date. Should fees not be settled by 14 days after the due date, I understand that my child’s seat at GIS will be withdrawn without further notice. Where companies are paying school fees directly, the parents are ultimately responsible and the above deadlines must still be adhered to. I understand that it is my responsibility to submit TWO MONTH’S NOTICE IN WRITING before the end of the last academic term attended by my child. Where companies are billed directly for school fees, it is still the responsibility of the PARENT to give GIS the required notice period in writing. In signing below I confirm that I have read and understood all the above and agree to be bound by the terms and conditions set out within it, and as may be amended by the School from time-to-time. 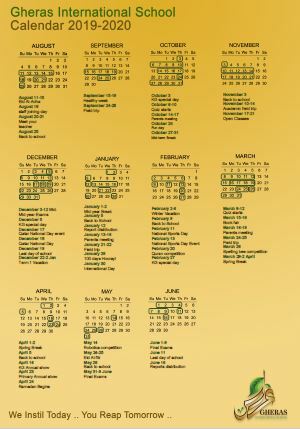 The academic year is divided into two terms. The tuition fee is payable in two (2) installments due on the dates specified for each term. There are no reimbursements for absence or illness. Fees are subject to annual review. Fees additional to those describe below are payable in respect with certain matters. These include but are not limited to costs for trips and visits, extra learning support and optional out of hours lessons for certain students. Such additional fees will be charged separately on a case by case basis. 1st Term Fees: payable immediately after acceptance. The following procedure will be followed when fees are not received by the due date. A text message and an email will be sent five (5) days after the due date. 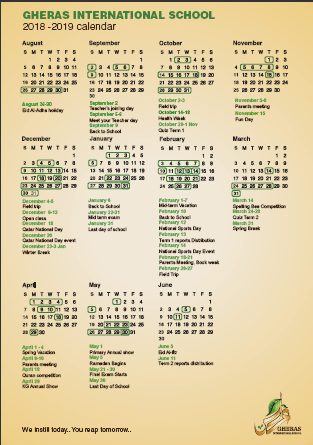 A letter will be sent home with the student ten (10) days after the due date. The student’s place will be withdrawn fourteen (14) days after the due date mentioned. In the case of a dishonoured cheque, the fees must be paid in cash within three (3) days of being notified. In the case of financial hardship, this must be communicated to the School CEO and Founder in writing. In cases of non-payment, any other school or educational establishment to which your child will be transferred will be informed of the outstanding fees. 100% refund of the tuition fees, where 1st Term Fees have been paid and written notice is given two (2) months before the end of the 2nd term of the previous academic year. QR 1000 will be charged as registration fees. 50% refund of the tuition fees, where 1st Term Fees have been paid and written notice is given no less than 45 days before the end of the 2nd term of the previous academic year. QR 1000 will be charged as registration fees. No refunds will be given after the mentioned deadlines. In case a student will transfer to a different school, an acceptance letter from the new school has to be submitted before December 1st of that Academic Year. I/We hereby acknowledge that I/we have read and understood the Fees Policy and Refund Policy of Gheras International School. Please complete the following. If needed, the Health Clinic will follow up to obtain further information. Does your child have any history of seizure disorder, heart conditions, diabetes, Asthma or any other medical concerns? Does your child have allergies or drug sensitivities? I give permission to the nurse to administer the above medications to my child for pain relief. If I, or my emergency contact person cannot be reached, GIS personnel have My full permission to provide/seek emergency medical treatment for my child.